Last week we had the privilege to attend the VeryFirstTo Awards in London, an event sprinkled with well-known personalities where we discovered what luxury products and venues launching in Spring 2013 have been deemed the most desirable. A panel of connoisseurs, which included Giles Deacon, Poppy Delevigne, Wayne Hemingway, Sir John Hegarty, John Mathers, Luke Johnson and Bip Ling, selected the winners of each category from a shortlist of forty brands that had themselves been whittled down from thousands. 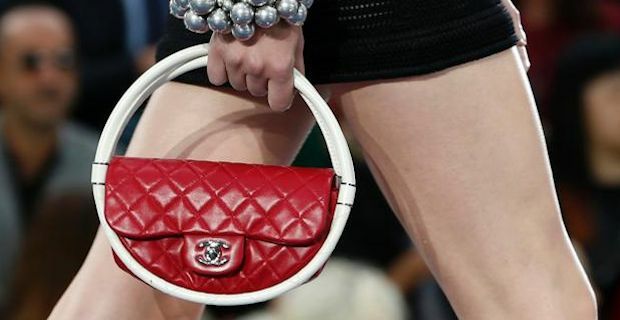 In the fashion department, designer women bags stole the show and Chanel’s Hula Hoop bag (pictured above) received one of the highest scores in the whole competition as it won the Fashion Accessories category. Eye-catching in its stylish originality, the Hula Hoop bag has been tipped to be one of this year’s must-have items, and it’s already Chanel's spring/summer 2013 catwalk most talked about fashion accessory. We’ve seen it on the runaways in several different sizes, thus broadening its appeal: the maxi size with its bold fashion statement can rock any mundane occasion, but wouldn’t be appropriate for certain events, such a corporate meeting. The smaller purse on the other hand - which measures 24 centimetres and is set to be retailed at a price of around £1,500 - can most definitely add some quirky elegance to most formal situations, as well as to your favourite nightclub nights. - Mulberry Willow tote bag: a two tier tote bag with a zip-detailed detachable envelope clutch, this new Mulberry bag is both practical and extremely elegant. Loved by Kate Moss - who was the first one pictured with it off the runway a day after it debuted in London - the bag has been the star of Mulberry's Spring 2013 collection. - Chanel Lego clutch bag: a young, stylish, slightly geeky clutch bag with attachable straps available in four different colours: green, yellow, red and pink. - Alexander McQueen embellished box clutch: an eye-catching golden clutch featuring ornate embellishments. - Alexander McQueen patent frame bag: black classic frame bag with side zip detail. - Marni grid bag: a homage to the german Bauhaus movement of the 20s, this Marni black and white bag is one of our favourites. The checks and grids decor has been a recurrent theme in Marni's Spring/Summer 2013 collection. - Bottega Veneta leather tassel bag: contemporary two-tier black leather bag featuring Bottega Veneta's signature tassel finishing. - Burberry Blaze bag: available in a range of jewel hues, the Blaze has already impressed those who's seen it, especially in its ruby PVC version. Are You Searching For Chanel Handbags in The UK?